So many brides these days dream of having a destination wedding in some exotic, tropical location. The thought of having a wedding ceremony at sunset on the beach, with the warm Caribbean breezes caressing you and your guests, stirs feelings of incredible romance in your soul. Many brides have taken this route and I am happy to say that I have had the pleasure of traveling to beautiful locations to capture extraordinary wedding photographs in some amazing tropical paradise venues.When brides and grooms come into my studio and gallery to discuss their plans, details, dreams and desires for their wedding day they spot this wedding photograph on the wall in my gallery and immediately ask where it was created. They are astounded when I tell them it wasn’t in the Dominican Republic or anywhere else in the Caribbean for that matter. It was not taken in Cacun or Cabo San Lucas. No...it was taken right here in Lindenhurst, New York at the fabulous Chateau La Mer overlooking the Great South Bay in Suffolk County Long Island!The professionals at Chateau La Mer in NY have done an amazing job of creating a tropical like experience right here in the shadow of New York City. Every season potted palm trees are brought out into the waterfront venue, famous for it’s beautiful sunsets overlooking Fire Island. A multi-level deck outside is the perfect spot for your cocktail hour reception as your guests enjoy the soft breezes coming off the water at sunset. A real treat is that Chateau La Mer owns their own glamourous bridal boat and your grand entrance into your cocktail hour is from this mini yacht which arrives on their private dock as your wedding guests cheer your arrival and welcome you to the party.If you are looking for a waterfront wedding venue that rivals the most luxurious resorts in a far off tropical paradise, then look no further than Chateau La Mer. 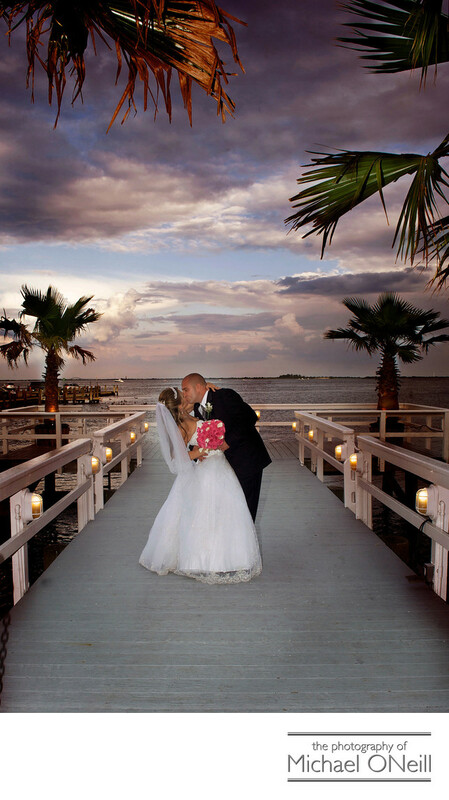 In the course of my long career as a Long Island, New York and NYC based wedding photographer I have had the pleasure of creating great wedding pictures at Chateau La Mer on numerous occasions. If you’re looking for a bridal photographer who knows the lay of the land...or in this case, the water...give me a call. I would love to be a part of your special day.